On the 18th and 19th of January World Snow Day was once again held in Magnitogorsk. 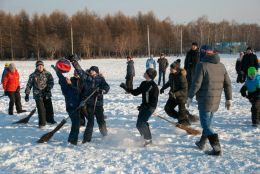 Firstly,World Snow Day started in the Ecological park of the city on January 18. Here visitors of the festival could participate in various contests and events, like mini football, curling, ice-hockey and even quidditch, that wizarding sport played on broomsticks. Moreover, there were contests and competitions for fans of skiing, skating and sledge riding. However, World Snow Day in Magnitogorsk is also a festival of creativity and imagination. Thus, participants of the snow sculpture competition could prove that a snow sculpture isn’t just a familiar snowman, but can be a real masterpiece. Still, art must benefit, that is why a new contest was organized this year, a bird feeder and birdhouse contest. All in all about 150 safe, comfortable and creative bird feeders and birdhouses were made for the competition. A giant snowball with the logos of the festival was once again made, but this year it was even larger with the diameter of 4 meters. Visitors were warmed by delicious and hot non-alcoholic drinks created by the city restaurants for the competition for the best winter cocktail. Finally a huge card with the wishes of the visitors written on it was released into the sky. The second day of the festival continued in the ski centre «Melallurg-Magnitogorsk» on the 19th of January. It was all also rich in events and competitions like winter kart and sledge racing, hockey in felt boots, skiing and snowboarding. In a special «musical pavilion» singing and dancing contests were held. An ice graffiti competition allowed participants to unlock their creativity to amaze everyone by their talent. All that was held to the foot tapping music of the most modern DJs.